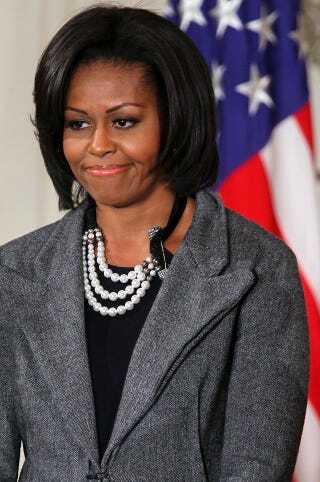 Is Michelle Obama Abandoning Fashion? You'd think "wear what you love" would be the most innocuous thing Michelle Obama could say. But in the opinion of one designer, "Five years of raising awareness for New York's Garment Center have been rendered irrelevant" by her words. Women, wear what you love. That's all you can say. That's my motto. It's nice to have on a nice suit. But it's nicer to change a generation, in terms of their health. It's a better use of my time to focus on rallying this country around our military families. I mean, there's so much that I hope to do in this role, that makes a difference in people's lives. What Michelle Obama chooses to wear can save and create American jobs. Her influence on the American fashion industry does not detract from her agenda in the East Wing. The First Lady can support her causes and simultaneously support a valuable American industry and the thousands of people it employs. I wish she would rethink her statement. On the one hand, a First Lady doesn't have the luxury of saying whatever she wants, even in frustration, and I get that. It's also slightly disingenuous, when Obama's deliberately taken a more daring path with her First Lady threads. On the other, in no way should her words be read as an indictment of American fashion. A missed opportunity to promote domestic fashion? Maybe — but Obama's continued "love" of designers like Jason Wu makes a statement of its own. When she wears a piece, according to this logic, it's because she loves it, not out of ideology (okay, theoretically — it's no coincidence when she wears American on election night), and isn't that as much of a vote for American fashion as anything? Besides, what if she did profess an abiding love for fashion? That — as Nancy Reagan and even Jackie Kennedy showed — can open you up to a whole different kind of criticism. Besides: fashion has one advantage over other causes. Whatever else the First Lady might be championing, she's got to wear something while she does it. And that speaks louder than words. Especially given that after this, people in the industry will probably be watching extra-closely.